Strong word of mouth and a weekend surge in attendance led Life of Pi to a surprising box office win last week over the 3D re-release of Roland Emmerich’s 2012. The Ang Lee directed adventure-drama (Chinese title: 少年派的奇幻漂流, or “Young Pi’s Rafting Fantasy”) netted $17 million in its four-day opening, versus a six-day total of $14.7 million for 2012. After two weeks at the top of the box office, Hong Kong actioner Cold War slipped by 49 percent to a $7.5 million haul. The film has edged out Silent War and now stands as the second highest-grossing Chinese language film so far this year, at $38.4 million. A pair of animation imports from Hollywood, Wreck–It Ralph and Rise of the Guardians, landed in fourth and fifth places, with $1.37 million and $1.14 million respectively. As is so often the case with non-sequel animated films, neither film has indexed well in China: Ralph will finish in fifth place among all 2012 animated releases in the PRC—notably, behind the Chinese cartoons Pleasant Goat and I Love Wolffy—and Rise of the Guardians will be lucky to crack the top ten (although it will probably surpass Pixar’s latest China misfire, Brave). Three significant factors are driving Life of Pi’s success: Its strong IMAX/3D footprint; high praise from critics and cultural influencers; and the drawing power of the film’s director, Ang Lee. China is one of IMAX’s top countries, not only in terms of screen count, but also in revenue per screen. 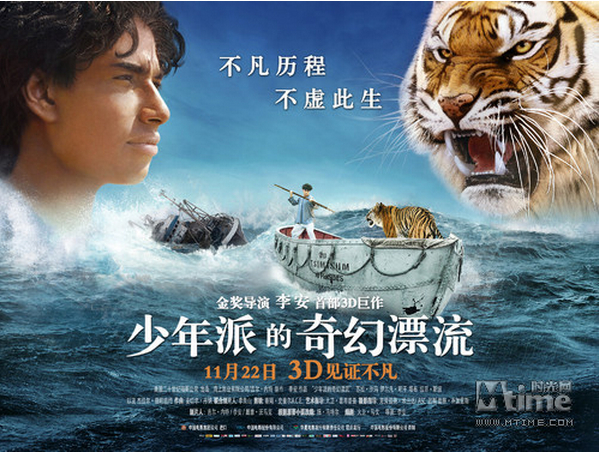 According to anecdotal reports I’m hearing, Life of Pi enjoyed IMAX’s third biggest ever launch in the PRC, behind Avatar and Titanic 3D. Critics praised the film not only for its lush imagery and superb direction, but also for its Asian viewpoint and deep philosophical essence. And after viewing the film such high profile stars as Lee Hom, Carina Lau and Shu Qi urged their millions of social media followers to come out and see the picture, helping to trigger a big weekend turnout. 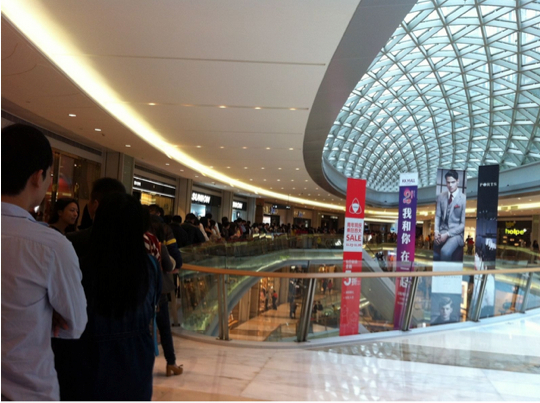 Filmgoers wait on a long line to see ‘Life of Pi’ at a Shenzhen theater. Finally, China’s filmgoers respond at least as much to top directors as they do to stars. Only a handful of directors have true drawing power, and Ang Lee is one of them. Life of Pi has a shot at topping $50 million in China; the only thing that might hold it back is a competing release from another marquee director, Feng Xiaogang (Aftershock, If You Are the One). It will be a surprise to many if Feng’s new film Back to 1942, which opens on Wednesday, November 29th, doesn’t break all records and become the highest-grossing Chinese language film ever. This entry was posted in Analysis, Box Office Reports and tagged 2012 3D, Ang Lee, Back to 1942, Feng Xiaogang, I Love Wolffy, Life of Pi, Pleasant Goat, Rise of the Guardians, Rob Cain, Robert Cain, Wreck-it Ralph by chinafilmbiz. Bookmark the permalink. Once again, enjoy your take on China’s film market w/one minor quibble. Chinese title for “Pi” as shown translates readily as “Pai’s Fantastic Voyage” (which it pretty much is). Sure there’s a 少年 in the title, but that’s mostly to modify/clarify “P(a)i” and not necessary to literally translate, especially with the photo of the boy at the top of the 电影海报. Otw, keep up the good work–don’t know of any other English language source for the valuable info you provide. Thank you for your correction. It should have read “Young (or Juvenile) Pi’s Rafting Fantasy.” I do my best to keep my Chinese up, but mostly from the wrong side of the Pacific, so I’ve gotten a little rusty.